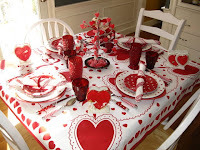 Nanalulu's Musings: Happy Valentines Day Check Out This Tablescape! Visit her blog Tabletop Time for more great pictures. Thanks for sharing Daphne!